Calling All Vendors and Artists! Since ValleyCon is the longest-running, most attended, largest festival of popular culture- featuring sci-fi, fantasy, horror, comics, gaming, anime and film & TV from Minneapolis to Seattle, it offers many awesome opportunities to vendors and artists. The convention has numerous attendees that span all the different genres our convention caters to. If you are a vendor and want to get your wares out in front of our attendee crowd, please check out the options detailed below for more information. 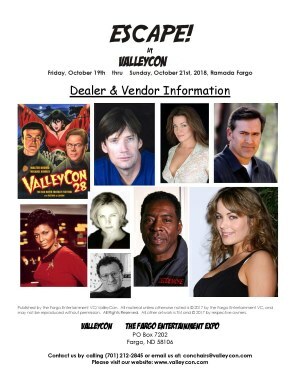 ValleyCon has featured some of the best of local and regional vendors, both businesses and individual proprietors, since ValleyCon 1 many, many years ago! It used to be called the "Huckster's Room" sometimes "Dealer's Room" now it's Vendor's Room. Through the name changes it's the best, hard to find merchandise, collectors' items, memorabilia, trinkets, jewelry, costumes, toys, comics, books, swords and much, much more! Most of these can only be found at ValleyCon once a year and many attendees make the Vendors Room their annual pilgrimage for unique holiday gifts or to find that certain something (at a deal far better than online) they've always wanted. ValleyCon has expanded the ARTIST ALLEY! This will be for Artists and Fan Tables ONLY and ONLY for those who can take down/move overnight! Availability is limited so get your form in ASAP!